1194 The second coronation of King Richard I of England takes place upon his return from the Third Crusade. 1421 The sea breaks through the dikes at Dort in the Netherlands, drowning more than 100,000 people. 1492 Italian navigator Christopher Columbus signs a contract with a representative of Spain's King Ferdinand and Queen Isabella, giving Columbus a commission to seek a westward ocean passage to Asia. 1521 The German Martin Luther is excommunicated from the Roman Catholic Church. The Church's action is based on Luther's attacks against the papacy and the sale of indulgences. 1524 Italian navigator Giovanni Verrazano discovers New York Harbor. "...The east coast of what is now known of the United States of America was largely unexplored in the early 1520s. The Spanish had discovered Florida, and the English and Portuguese Newfoundland, which was already visited frequently by fishermen and whalers of various nations, but the area between these two areas was still a white spot on the map. Maybe a route to Cathay (China) could be found there? Perhaps even one that was shorter than the known ones around the Cape of Good Hope or through the Straits of MagalhÃ£es? King FranÃ§ois-premier (Francis I) of France decided to send out an expedition to investigate the area. As he was a fan of everything Italian, it is no wonder that he chose the Florentine Giovanni da Verrazzano to lead the expedition. The expedition was also backed by wealthy Italian bankers and merchants living in Lyons. Strangely, the year is given in books on the subject sometimes at 1524, sometimes as 1525. I have no idea which one is correct. Although we do not know this for sure, it is generally assumed that Verrazzano was born in or around 1485, on his family's castle, Castello Verrazzano, near Val di Greve, 30 miles south of Florence. Upon reaching majority (also around 1506-7) he moved to Dieppe, France, to pursue a maritime career. He made several voyages to the Eastern Mediterranean, and probably also visited Newfoundland. Verrazzano had been provided with four ships, but two of them shipwrecked shortly after depart, while a third one was sent home carrying the prizes from privateering on the Spanish coast, so only the flagship La Dauphine actually made the crossing of the Atlantic. The ship measured 100 tuns and had fifty men crew. Of these, the only one who is known apart from Verrazzano himself was his brother Girolamo da Verrazzano, who was a mapmaker. His 1529 world map was one of the two first maps to show Verrazzano's discoveries (the other was Vesconte de Maggiolo's 1527 map of the western hemisphere). He set out for his crossing from Madeira, on 17 January, and touched land on or around 1 March, at Cape Fear. From here he first sailed south, but he returned at some unknown point (yet north of Charleston), being afraid to run into the Spanish, and anchored not far from his original landfall. Unlike other explorers of the day, he preferred to anchor well out at sea. He did, however, send a boat, to the shore, and had a pleasant meeting with the natives, whom he describes thus..."
1555 The city of Siena surrender to Philip of Spain after a lengthy famine. He will later sell Siena to Cosimo de Medici. 1704 John Campbell, known by many as Americas first news vendor, publishes what will eventually become the first successful American newspaper, the Boston News-Letter. 1790 Death: US Statesman Benjamin Franklin, in Philadelphia at the age of 84. "Franklin was one of the leading founding fathers of the United States of America. He signed the Declaration of Independence and the Constitution of the United States, and served as the new nation's ablest diplomat. Franklin's formal schooling ended early but his education never did. He believed that "the doors to wisdom are never shut," and read every book he could get his hands on. Franklin taught himself simple algebra and geometry, navigation, logic, history, science, English grammar and a working knowledge of five other languages. Franklin had a simple formula for success. He believed that successful people worked just a little harder than other people. Benjamin Franklin certainly did. He built a successful printing and publishing business in Philadelphia; he conducted scientific studies of electricity and made several important discoveries; he was an accomplished diplomat and statesman; he helped establish Pennsylvania's first university and America's first city hospital. He also organized the country's first subscription library. Franklin was also unequaled in America as an inventor until Thomas Edison. He invented the Franklin stove, bifocal eyeglasses and the lightning rod. Franklin wasn't greedy about his inventions, preferring to have them used freely for the comfort and convenience of everyone. Thomas Jefferson called Benjamin Franklin "the greatest man and ornament of the age and country in which he lived." Frankilin had a strong belief that good citizenship included an obligation of public service. Franklin himself served the city of Philadelphia, Pennsylvania and the new United States of America, in one way or the other, for most of his life. To Benjamin Franklin there was no greater purpose in life than to live usefully." 1810 Pineapple cheese is patented by Lewis M. Norton of Troy, Pennsylvania. 1837 Birth: J.P. Morgan, American industrialist and financier. 1860 New Yorkers learn of a new law requiring fire escapes to be provided for tenement houses. 1861 Virginia, caught between the warring states, takes its first step toward secession. It is soon followed in turn by Arkansas and North Carolina. 1864 Schleswig Holstein-Prussian War: 16,000 Prussians under Prince Frederick Charles storm the fortress at Dueppel held by 22,000 Danes. More than 5,500 Danes die in the attack. 1894 Birth: Nikita Khrushchev, former Soviet Premier. "Nikita Khrushchev began his working life as child in the coal mines. He joined the Communist party in 1918 and fought with the Red Army during the civil war. In the 1920s Khrushchev began his rapid rise to power and by the time Joseph Stalin died in March 1953, he was secretary of the Central Committee of the Communist Party. By 1958 he had outmaneuvered his political rivals becoming the Soviet Premier. From his very first full briefing on nuclear weapons in September of 1953, Khrushchev clearly understood the special terror of the hydrogen bomb. "When I was appointed First Secretary of the Central Committee and learned all the facts of nuclear power I couldn't sleep for several days," he confessed. "Then I became convinced that we could never possibly use these weapons, and when I realized that I was able to sleep again." At the Twentieth Party Congress in February 1956, two months after the successful test of the Soviet hydrogen bomb, Khrushchev formally broke with Stalin's revolutionary tenet that a new world war was inevitable. "Either peaceful coexistence or the most destructive war in history," he declared, "there is no third way." 1895 The Sino-Japanese War ends with the Treaty of Shimonoseki, whereby China and Japan recognize Korea's independence and China cedes Formosa to Japan. 1917 A bill in US Congress to establish Daylight Savings Time is defeated. 1917 WW1: Trotsky and his companions arrive in Petrograd from New York and soon join forces with Lenin. (Prince Michael Sturdza of Romania says Lenin arrived on the 17th and that Trotsky was already in Petrograd when Lenin arrived.) Stuart Kahan in The Wolf of the Kremlin says that Trotsky didn't arrive until early May, and went directly to the Tauride Palace where the Soviet was already in session. 1918 WW1: The German drive at Lys is halted after gaining only 10 miles including the Messines Ridge. Ludendorff achieves tactical success, but a strategical failure. There is no breakthrough, and the Channel ports are safe. 1935 The League of Nations censures Germany's rearmament policy. 1937 The Polish parliament passes a bill outlawing Jewish ritual slaughter (Shechita). 1938 An attempted coup by Fascists and the Iron Guard is smashed by the Romanian government. Many of the instigators are arrested. 1939 Britain and France reject a Soviet offer to form an anti-Nazi alliance. 1939 Soviet Ambassador Alexei Merekalov calls on Ribbentrop's chief subordinate, Baron von Weizacher and offers unmistakable signals that Russia is now willing to develop better relations with Germany. 1941 WW2: The brave resistance of the Yugoslav army is crushed by German armor striking from Hungary, Romania, Bulgaria and Germany itself. German High Command declares that the Yugoslav unconditional surrender comes into force from noon tomorrow. Croatia soon becomes an independent state, ruled by the pro-Nazi "Ustachi." Persecution of Croatian Jews begins immediately. Meanwhile, German troops, freed by the collapse of the Yugoslavs, push on deep into Greece. 1941 Igor Sikorsky accomplishes the first successful heliocopter (helicopter) lift-off from water near Stratford, Connecticut. "...His dogged determination and faith in his own ability to build what many considered to be an impossible vehicle established the bedrock upon which today's helicopter industry rests. Military contracts followed the success of the VS-300, and in 1943, large-scale manufacture of the R-4 made it the world's first production helicopter. The R-4 was followed by a succession of bigger and better machines and since then, the helicopter has clearly established its ability to perform a myriad of difficult missions, including the saving of thousands of lives, in both peace and war. Mr. Sikorsky was especially proud of the helicopter's life saving ability and of organizations such as the Aerospace Rescue and Recovery Service which had put helicopters to what he believed was their finest use. During his career, he rarely passed up an opportunity to stress this role or praise the men whose skill and courage made the rescues possible. The pilots of rescue helicopters have contributed "one of the most glorious pages in the history of human flight..."
1942 WW2: The first issue of Stars and Stripes, a new US Army weekly newspaper, is published in London. 1944 WW2: In Italy, Marshal Pietro Badoglio's Cabinet resigns, and he is invited to form a new government. 1946 The last French troops leave Syria. 1951 Diary of Leon Gladun: Jacek z pierogami [with dumplings] reported to this world at 4 in the morning at Paddington Hospital. Weight: 6 lbs 6 ounces. When they laid him next to his mother, he sneezed and she wished him Na Zdrowie! (To your Health!) Then he let out three bubbles from his mouth as a sign that he spits on the world and everything. 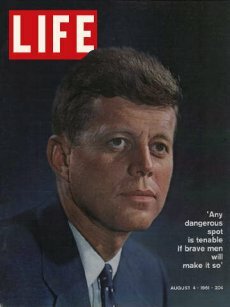 1961 Bay of Pigs: An attempt to invade Cuba by US-backed, CIA-trained Cuban exiles fails at the Bay of Pigs. 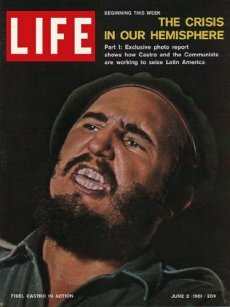 In a failed attempt to overthrow the government of Fidel Castro, the three-day battle leaves 100 killed and more than 1,000 captured. "...When teams of U.S. B-26 bombers began attacking four Cuban airfields simultaneously on Saturday, April 15, the Cubans were prepared. 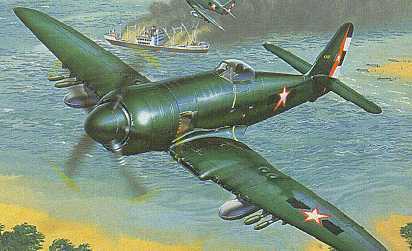 The few planes belonging to the Cuban Air Force were dispersed and camouflaged, with some obsolete, unusable planes left out to fool the attackers and draw the bombs. As part of the CIA cover story, the attacking B-26 planes were disguised to look as if they were Cuban planes flown by defecting Cuban pilots. An exile Cuban pilot named Mario ZÃºÃ±iga was presented to the media as a defector, and was photographed next to his plane. The photo was published in most of the major papers, but the surprising omission of several serious details, and the overwhelming amount of information already gathered by reporters, helped bring out the truth much sooner than anyone expected. Prior to the start of the operation, CIA operatives were sent to Cuba. Their job was to aid the invading forces by blowing up key bridges and performing other acts of terrorism that would make it appear that the people of Cuba were joining the invasion. JosÃ© Basulto was one of those operatives. He flew straight into Havana airport posing as a student from Boston College coming home on vacation. Shortly after the attack started, Ambassador Adlai Stevenson, at the United Nations, flatly rejected Cubaâ€™s Minister of Foreign Affairs RaÃºl Roaâ€™s report of the attack to the assembly, saying that the planes were from the Cuban Air Force and presenting a copy of the photograph published in the newspapers. In the photo, the plane shown has an opaque nose, whereas the model of the B-26 planes used by the Cubans had a Plexiglas nose. Stevenson was extremely embarrassed a few hours later when the truth was revealed and he learned that Kennedy had referred to him as â€œmy official liar.â€� The landing began shortly before midnight on Sunday, April 16, after a team of frogmen went ashore and set up landing lights to guide the operation. The invading force consisted of 1,500 men divided into six battalions, with right-winger and CIA-friendly Manuel Artime as the political chief. Two battalions came ashore at..."
1964 Washington's FBI lab reports it can't determine the lyrics to Louie Louie. 1968 US President Lyndon B. Johnson meets with South Korean President Park Chung Hee in Honolulu, pledging US protection for noncommunist Asia. 1969 The voting age is lowered from 21 to 18 in Britain. 1969 A jury in Los Angeles convicts Sirhan Sirhan of assassinating Senator Robert F. Kennedy. 1969 Czechoslovak Communist Party chairman Alexander Dubcek is deposed. 1970 The cliffhanging flight around the moon of Apollo 13 ends in triumph today when the capsule splashes down in the Pacific. For 90 hours the ship traveled through space after being crippled by an explosion in the service module, a tank of liquid oxygen burst. Astronauts James Lovell, John Swigert, and Fred Halse are all safe. 1970 Johnny Cash plays at the White house for President Nixon, who requests that he play A Boy Named Sue. 1971 Egypt, Syria and Libya sign an agreement to form a confederation. 1971 East Pakistanis declare their homeland an independent nation which they rename Bangladesh. Sheik Mujibur Rahman serves as the nation's first prime minister. 1975 Phnom Penh falls to the Communist Khmer Rouge guerrillas, ending Cambodia's five-year war, and beginning a reign of terror in which more than one million people will die. 1977 Women vote in Liechtenstein for the first time. 1980 The Union Jack is lowered for the last time in Africa on this day when the embattled ex-British colony of Rhodesia becomes Zimbabwe. Prince Charles, representing the Queen, presents the instruments of sovereignty. Robert Mugabe, the new Prime Minister, speaks of the need for reconciliation between blacks and whites. 1981 Polish farmers win the legal right to form a trade union. 1985 Lebanese Prime Minister Rashid Karami resigns in protest over Druze militia attacks in West Beirut, but stays on in a caretaker capacity. 1986 British journalist John McCarthy is kidnapped in Beirut. He will be released in August 1991, by the Islamic Jihad. 1986 Britons Philip Padfield, John Leigh Douglas and American Peter Kilburn are found shot dead. The pro-Libyan Revolutionary Cells declares that it killed them in retaliation for the US bombing of Libya. 1989 The Polish trade union Solidarity is legalized after a seven-year ban, clearing the way for the downfall of Poland's Communist Party. 1990 President George H. Bush warns the Soviet Union against carrying out an economic blockade of Lithuania. 1991 The Dow Jones industrial average closes above 3,000 for the first time, at 3004.46. Experts hail it as forecasting an end to the recession. 1995 A US Air Force jet explodes and crashes in a wooded area in eastern Alabama, killing eight people, including an assistant Air Force secretary and a two-star general. 1996 US President Bill Clinton and Japanese Prime Minister Ryutaro Hashimoto sign a joint declaration on security cooperation that pledges to maintain US military force levels in both Japan and elsewhere in Asia. 1997 House Speaker Newt Gingrich announces that former Senator Bob Dole, R-Kansas, will lend him the money to pay his fines after the Georgia Republican admitted to using tax-exempt donations for political activities. 2000 With an eye toward China, the Clinton administration decides not to sell Taiwan all the weapons it had requested. 2001 Mississippi voters, by a 2-1 margin, decide to keep their state flag, which includes the Confederate battle cross in the upper left-hand corner.